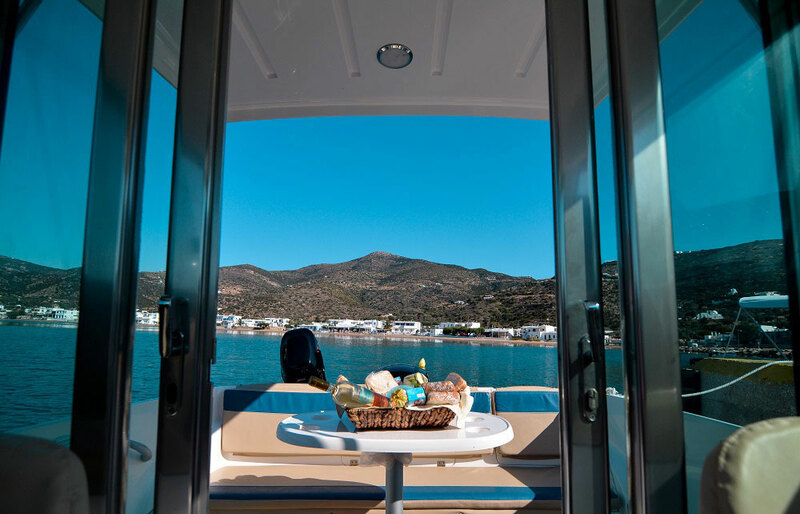 Looking for an experience you will never forget while in Paros? Sail to the nearby astonishing island of Milos for a unique full-day cruise. Dive in its turquoise waters, discover its colorful volcanic beaches and surrender to its unparallel beauty. 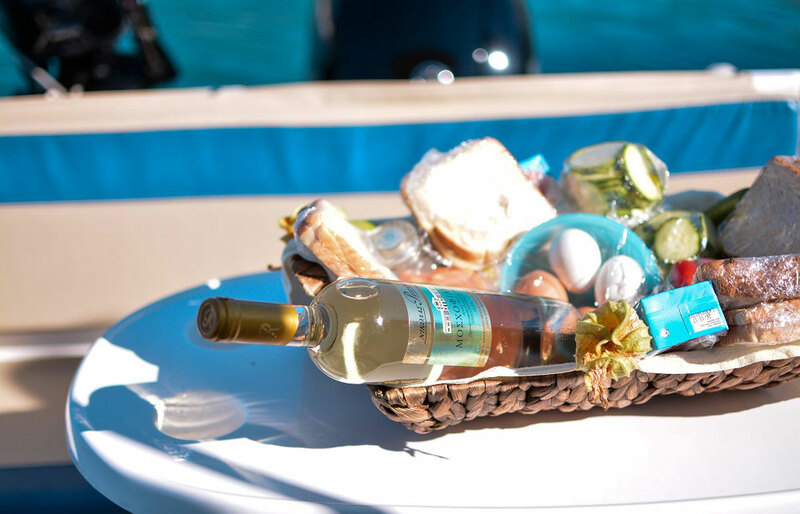 In this full day cruise you will depart from Paros and head towards Milos. On your way, you will make a short stop to the small islet of Kalogiroi, where you will see magnificent rocks forming big hexagon prisms. 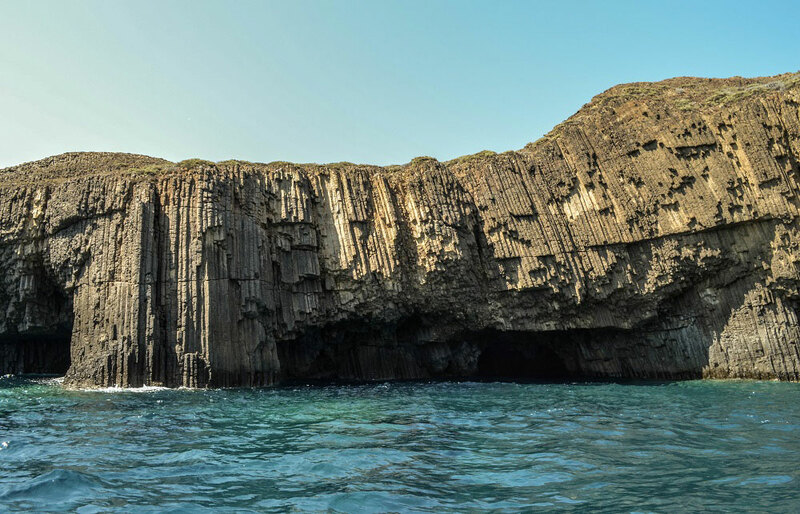 You will then cruise towards Glaronisia complex and reach the cavern of Papafragas in Milos, a deep sea cave, where you can swim in green-blue waters between white-grey rocks leading to the open sea, snorkel and enjoy this unique geological phenomenon. Afterwards, you will visit the Navagio (Shipwreck), where you will make a stop to swim in its deep waters, see the old shipwreck that is situated 8 – 10 meters below surface level. Next, you will stop in Sarakiniko, one of the most photographed beaches in the Aegean. Its magical landscape will give you the feeling of standing on the surface of the moon. Here you will swim in deep turquoise waters, dive off the remarkable white volcanic rocks and enjoy the famous fiords. 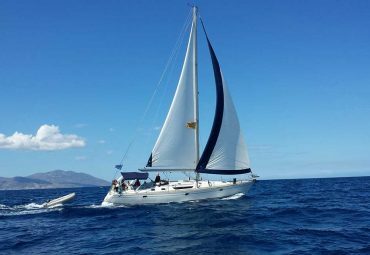 Then, you will head to the north towards the Kabanes cape of and reach Mandrakia, where you can admire the hundreds of small creeks, reefs and rocks that barely make it out of the sea surface, as well as colorful “syrmata” (parking for boats). 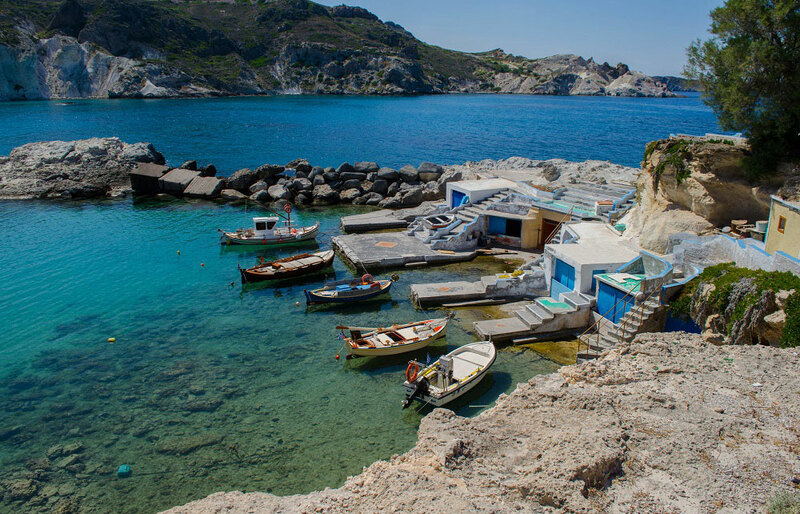 You will then continue your cruise along the coast of Milos to reach the traditional fishermen’s village of Fyropotamos, famous for its traditional houses “syrmata”, situated right at the sea to shelter the fish boats in the winter. Here, on brightly painted doors, you can have your postcard – like photo of Milos! 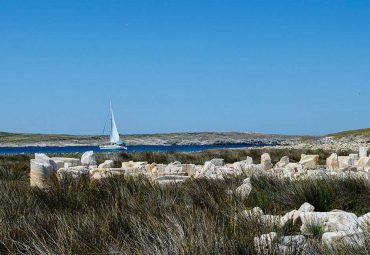 Next, you will cruise along the twin islets of Akrathi and Arkadi that “guard” Adamas’ port and reach cape Vani. Soon after, you will reach Sykia cave, a roofless cave with shiny waters and a small beach. Sykia is the perfect place for snorkeling, as it is surrounded by corrals that take different colors depending on the sunbeams that light them. After your dives in Sykia, you will pass from cape Psalis and change your course to reach one of the top-sights in Milos, Kleftiko, known also as “The Meteora Rocks of the Sea”. Kleftiko is one of the most photographed landscapes in Greece, famous worldwide. 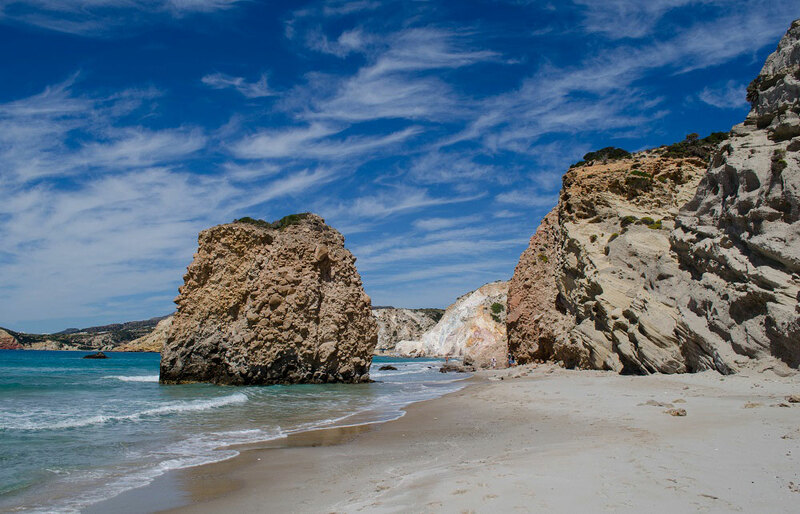 After enjoying this impressive location with dramatic rock formations coming out of the sea, forming natural caves and underwater passages, you will continue to see the tens of small beaches and bays on the south side of Milos, such as Gerontas, Firiplaka, Agios Sostis, Provatas, and Palaiochori. 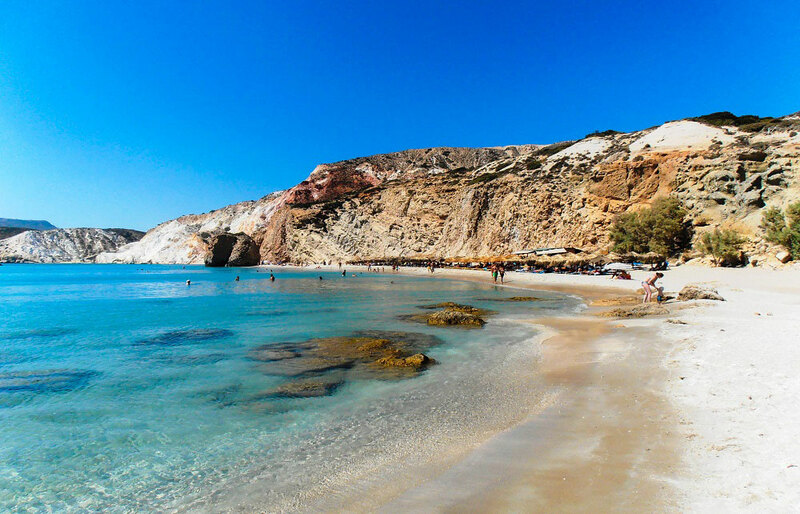 Finally, you will arrive at the amazing beach of Gerakas, with the unique grey and pink sand that flows like a waterfall from the mountain and the small cavities with hot spring waters from the volcano of Milos. It is really worth swimming in the amazing blue waters of Gerakas. You will then head to the renowned Sulphur mines of Milos, were you will make and your final stop. Before heading back to Paros, you will have the opportunity to visit the old mine, which was operating until the mid-1950s, and see the hot rocks and the red water coming out between them, and was abandoned abruptly, almost overnight, making it a true “Ghost” town. 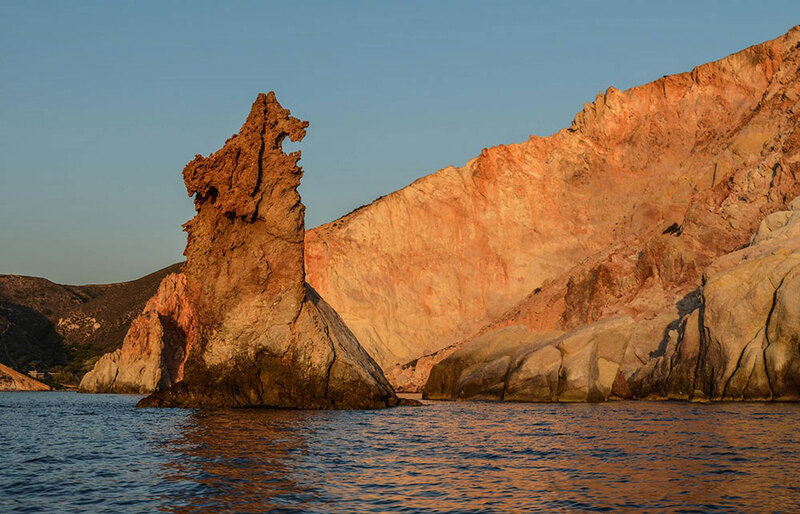 You will start early morning to sail to the nearby astonishing island of Milos for a unique full-day cruise. Dive in its turquoise waters, discover its colorful volcanic beaches and surrender to its unparallel beauty. On your way, you will make a short stop to the small islet of Kalogiroi, where you will see magnificent rocks forming big hexagon prisms. 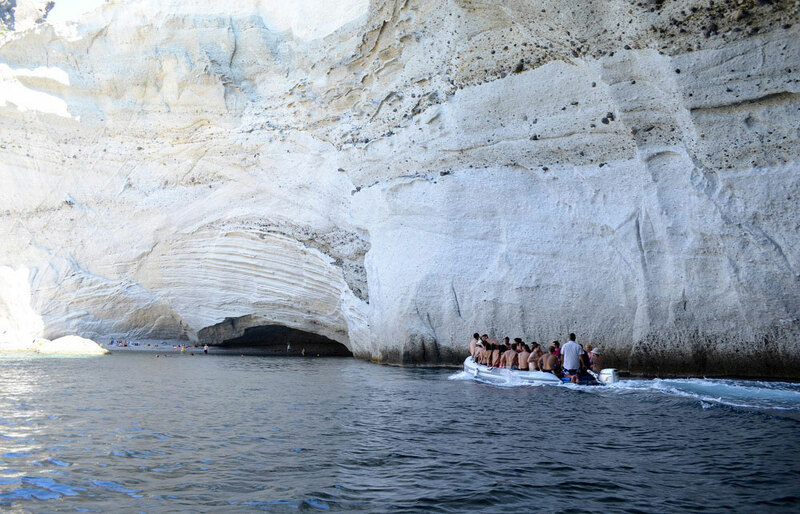 You will then cruise towards Glaronisia complex and reach the cavern of Papafragas in Milos, a deep sea cave, where you can swim in green-blue waters between white-grey rocks leading to the open sea, snorkel and enjoy this unique geological phenomenon. Afterwards, you will visit the Navagio (Shipwreck), where you will make a stop to swim in its deep waters, see the old shipwreck that is situated 8 – 10 meters below surface level. Next, you will stop in Sarakiniko, one of the most photographed beaches in the Aegean. Its magical landscape will give you the feeling of standing on the surface of the moon. Here you will swim in deep turquoise waters, dive off the remarkable white volcanic rocks and enjoy the famous fiords. 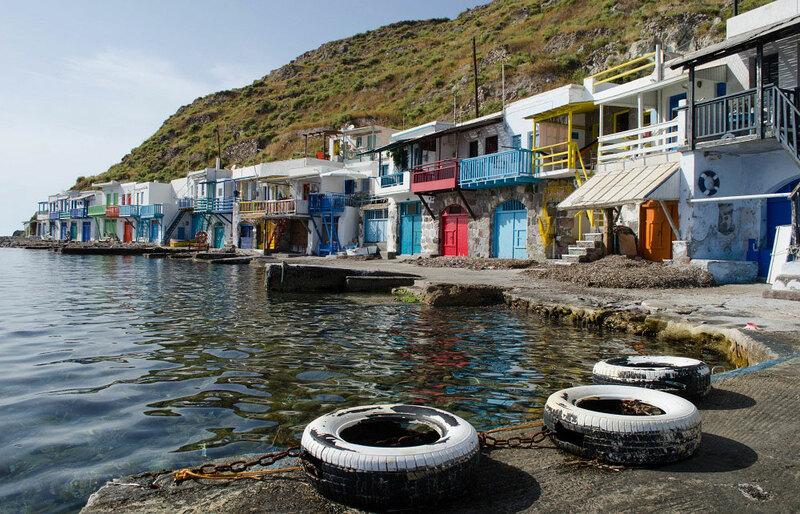 Then, you will head to the north towards the Kabanes cape of and reach Mandrakia, where you can admire the hundreds of small creeks, reefs and rocks that barely make it out of the sea surface, as well as colorful “syrmata” (parking for boats). 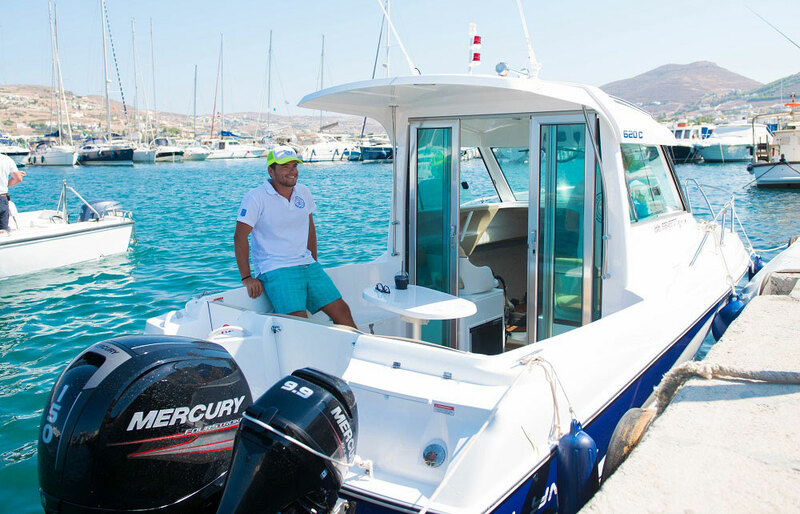 You will then continue your cruise along the coast of Milos to reach the traditional fishermen’s village of Fyropotamos, famous for its traditional houses “syrmata”, situated right at the sea to shelter the fish boats in the winter. Here, on brightly painted doors, you can have your postcard – like photo of Milos! Next, you will cruise along the twin islets of Akrathi and Arkadi that “guard” Adamas’ port and reach cape Vani. 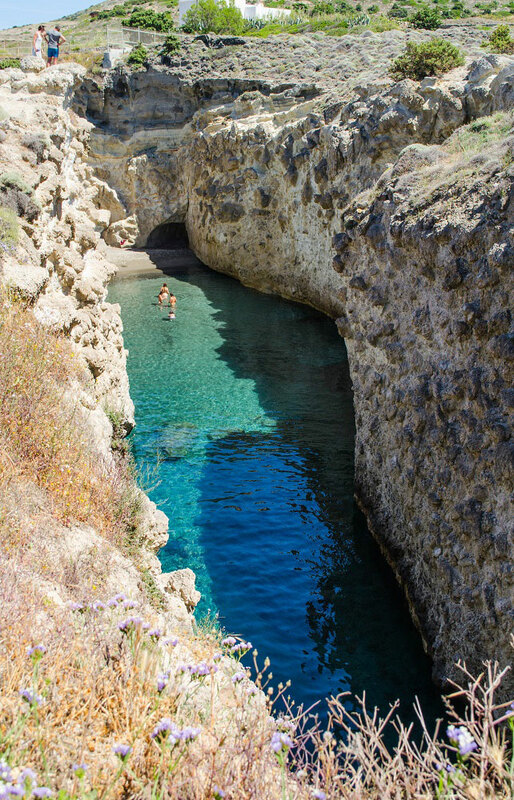 Soon after, you will reach Sykia cave, a roofless cave with shiny waters and a small beach. Sykia is the perfect place for snorkeling, as it is surrounded by corrals that take different colors depending on the sunbeams that light them. After your dives in Sykia, you will pass from cape Psalis and change your course to reach one of the top-sights in Milos, Kleftiko, known also as “The Meteora Rocks of the Sea”. Kleftiko is one of the most photographed landscapes in Greece, famous worldwide. 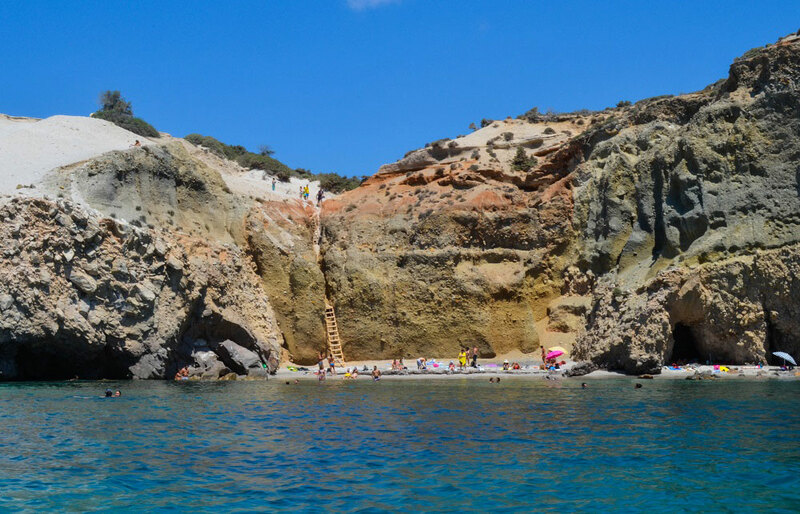 After enjoying this impressive location with dramatic rock formations coming out of the sea, forming natural caves and underwater passages, you will continue to see the tens of small beaches and bays on the south side of Milos, such as Gerontas, Firiplaka, Agios Sostis, Provatas, and Palaiochori. 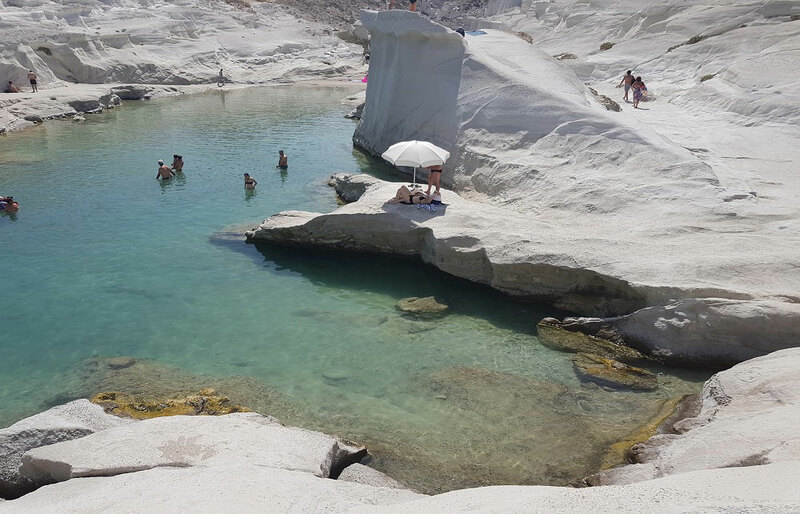 Finally, you will arrive at the amazing beach of Gerakas, with the unique grey and pink sand that flows like a waterfall from the mountain and the small cavities with hot spring waters from the volcano of Milos. It is really worth swimming in the amazing blue waters of Gerakas. You will then head to the renowned Sulphur mines of Milos, were you will make and your final stop. Before heading back to Paros, you will have the opportunity to visit the old mine, which was operating until the mid-1950s, and see the hot rocks and the red water coming out between them, and was abandoned abruptly, almost overnight, making it a true “Ghost” town. 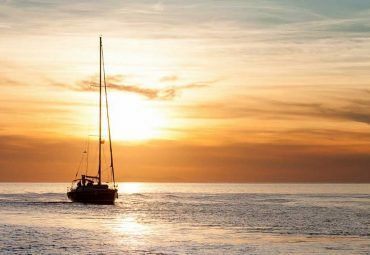 After a full day of unforgettable memories, you will sail back to Paros . 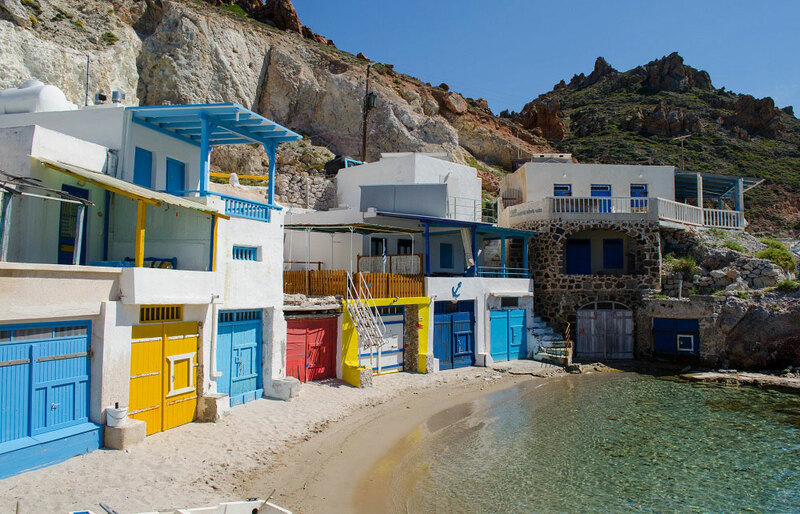 There are only few places in the world as magical as Milos! 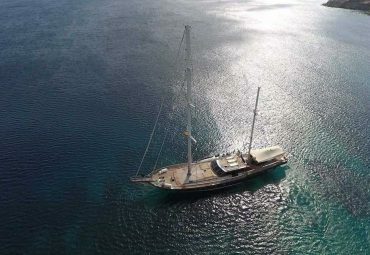 It is an absolute must see during your visit in the Cyclades!